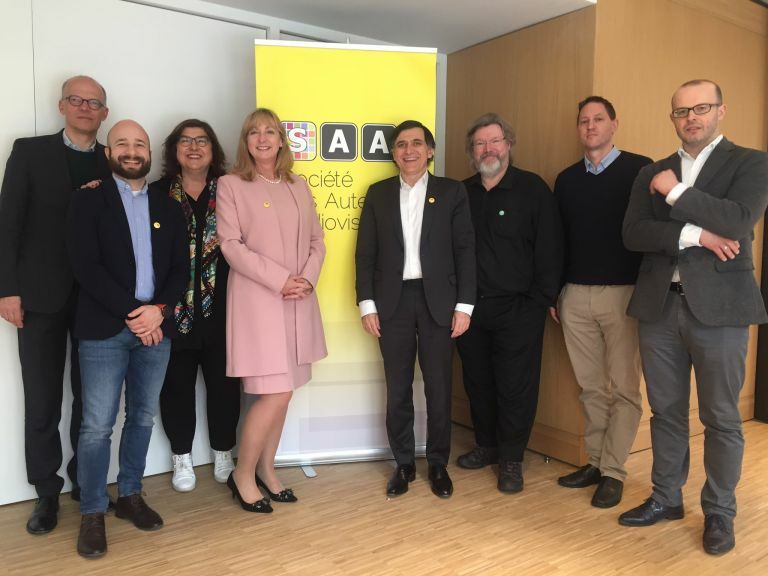 The Society of Audiovisual Authors (SAA) is delighted to announce its new board, which was elected on 27 March 2019 by its general assembly of members made of European collective management organisations (CMOs). Barbara Hayes and Patrick Raude have been renewed in their respective positions of chair and vice-chair of the board. The new board will lead the work of the organisation for the next three years. They will provide guidance and support to the team directed by Cécile Despringre in a very changing institutional environment with a new European Parliament and a new Commission. The audiovisual sector is going through important changes too, with the growing interest of international video-on-demand services to produce in Europe. At the general assembly meeting, members discussed a strategic plan focusing on the promotion of the collective management of audiovisual authors’ rights, in particular in the online environment. The board will rely on dedicated working groups made of SAA’s members to deal with all those important matters. SAA - The Society of Audiovisual Authors is the umbrella association of European collective management organisations representing audiovisual authors. Its 32 members in 24 countries manage rights for over 140,000 film, television and multimedia European screenwriters and directors. @saabrussels. Press: Cécile Despringre, c.despringre@saa-authors.eu, +32 475 65 24 99.